The Landford Stone 2014 big launch is nearly here. If you would like any samples or information on the new TELTOS range then please contact us ASAP on the details below. TELTOS Quartz, from its initial production facility in China, has now opened a brand new purpose built factory with state of the art quartz production lines installed. This will produce a top quality range of quartz slabs, with the added advantage of lower prices on direct imports. TELTOS has an in-depth knowledge of the market and its requirements and will be able to develop new colours as trends change over time. Landford Stone have been searching for a superior manufacturer of quartz slabs in China and have found it with the TELTOS range. 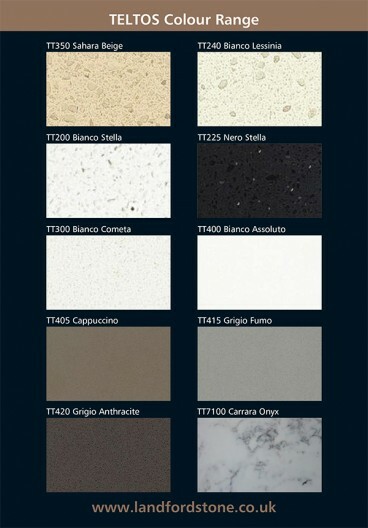 Working with TELTOS, we have selected 10 colours, which we are importing to the UK. The colours have been selected based on information from kitchen companies that we work very closely with. This is in essence, the range that you, the end user have selected. The TELTOS material comes with a 15 year warranty that no other quartz material on the market offers. With a quality product such as TELTOS, at very competitive prices, you can be sure that with Landford Stone as the supplier and installer of your projects, you will have the best quality material and installation.